Bram Stoker’s Dracula. Richard Marsh’s The Beetle. Arthur Conan Doyle’s The Parasite. Marie Corelli’s Ziska. Arthur Machen’s The Great God Pan. Ishiro Honda’s Matango. William Hope Hodgson’s “The Voice in the Night.” Angela Carter’s “The Lady of the House of Love.” Richard Laymon’s The Traveling Vampire Show. Cormac McCarthy’s Child of God and Blood Merdian. Brett Easton Ellis’s American Psycho. Shirley Jackson’s The Haunting of Hill House. Helen Oyeyemi’s White is for Witching. H.P. Lovecraft in Comics. Werner Herzog’s Grizzly Man. Srdjan Spasojevic’s A Serbian Film. Sharla Hutchison and Rebecca A. 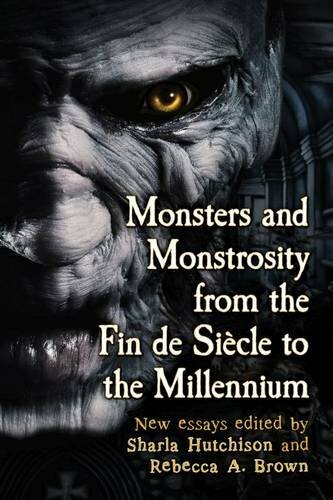 Brown edited MONSTERS AND MONSTROSITY FROM THE FIN DE SIECLE TO THE MILLENNIUM, a collection of essays that discusses all of these works, essential if you want to be in the know about modern horror. I wrote the essay on A Serbian Film, generally considered by people in the know to be among the ugliest films ever made. Go on. Feed your head. Get the book from the publisher, McFarland, or from Amazon. Give it as a gift. Insist on getting it as a gift. All of the above. You can never have too many monsters.